I am obsessed with Pinterest. My Sweet Tooth board alone has 85 pins. And yet, ask me how many of those recipes I've actually made? Apparently, I like thinking about food more than actually making it sometimes. But when the Mr. was off watching football the other night (sigh, is it Fall already?! ), I was finally feeling bored enough motivated to try something from Pinterest. I'd had my eye on these French Muffins for ages, and they only required ingredients I had on hand. Bingo! These little babies were ridiculous! So easy to make and imminently scarfable. Muffins all too often nearly choke you with their cakey dryness. 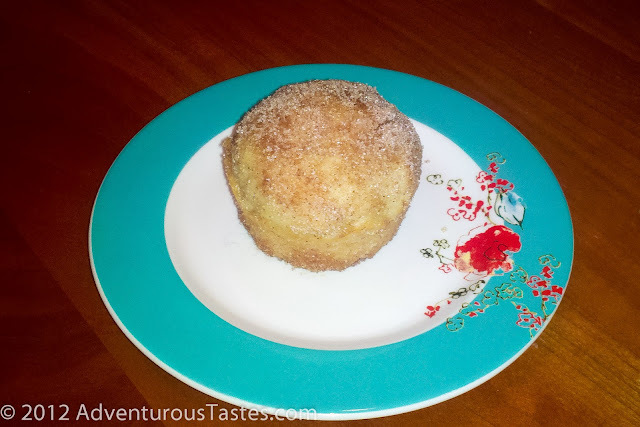 But when warm, the insides of these muffins are oh so soft, and the buttery cinnamon sugar exterior is just as wonderful as you'd imagine. I found some tips on properly storing muffins here, and opted to leave two out under a clean towel for the following day's breakfast, and stored the rest in a sealed container lined with paper towels. Worked like a charm and taste just as good when nuked for 10 seconds as they did fresh baked! Devour and silently thank me.